Slip on a slide, find yourself a talk box and let’s hit the high trail! We examine Joe Walsh’s Rocky Mountain Way. The riff is easy enough to master but the technique needed for slide pushes the rating up a couple of notches Well, I suppose it comes down to taste in the end, but, for me, Rocky Mountain Way just about sums up everything I like about guitar playing. Another memorable moment which involved this song was a line-up of guitar superstars at the Seville Guitar Festival in the early 90s getting everything hopelessly wrong in the timing department while trying to play the song in an ensemble. The line-up just happened to include Joe Walsh himself, which could have been severely embarrassing if it wasn’t for the fact that the whole sorry debacle was clearly the drummers’ fault (there were two of them, you see). We must remember that, to a drummer, “synchronisation” is a four-letter word. In any case, Rocky Mountain Way remains a rock guitar classic and sneaks under our blues banner by virtue of the fact that the chord arrangement is extremely bluesy indeed! The guitar part slips nicely into three separate sections: the rhythm part, the slide and talk box solo. Uncannily enough, these would be suited to different levels of playing ability. I would say that the rhythm part could be filed under easy – and you had a practice run at it when we looked at Muddy Waters style blues. The slide part is obviously going to call for some special technique – slide technique would be a good start, for instance. Some time ago we spoke about techniques in slide guitar lesson. But if slide is not your thing then you can customise both solo and inter-verse lick parts to standard fretted guitar playing and still be able to hold your head up in public with no problem. The talk box solo fits in snugly around the intermediate area; this isn’t because it’s fast or anything, it will be the timing and some of the bends that could trip you up. It’s probably a good idea to look at the three parts separately, too. Given that there is no substitute for good solid rhythm playing, the chordal riff to this song is a very good place to hone a few skills in that respect. In fact, there’s more than just the one riff to consider: there’s the intro riff, second intro and inter verse riff and the basic verse Muddy-style riff. Do we offer value for money here on the blues page or what? Each of them will take a little work to get just right but it’s worth taking the time to polish up your rhythm chops. The conventional way to approach the slide guitar part would be to use a slide on your third or fourth left hand fingers and make sure you play exactly above the frets (as opposed to in between them as you would when using your fingers) and add splashes of side-to-side vibrato as you go. The great slide player Bob Brozman insists that slide vibrato is like manipulating a bowl of jelly – you go one way, it goes the other. He also states a similarity to a certain part of the female anatomy, too, adding that “slide players make better lovers…”. I don’t know how true any of this is, but it’s a lovely thought. If you’re new to slide playing, just take things slowly and listen very carefully to the notes you produce, watching out for pitch control at all times. Slide playing is a bit like playing fretless guitar: intonation is critical and any undue sloppiness in this department is going to cause universal distress! The guitar solo in Rocky Mountain Way is not awkward. You might have to resort to the wah wah pedal option, rather than the talk box. But even if you decide to go ‘au natural’ with it, the notes are still good enough to make a great-sounding solo in their own right. If you do happen to own a talk box and want to go for it, then listening to the “vowel” sounds Joe is making with his mouth is fairly important for 100 per cent authenticity. But I’m sure nobody will take too much offence if you’re slightly off-target in this department. Have fun with the guitar in this song. 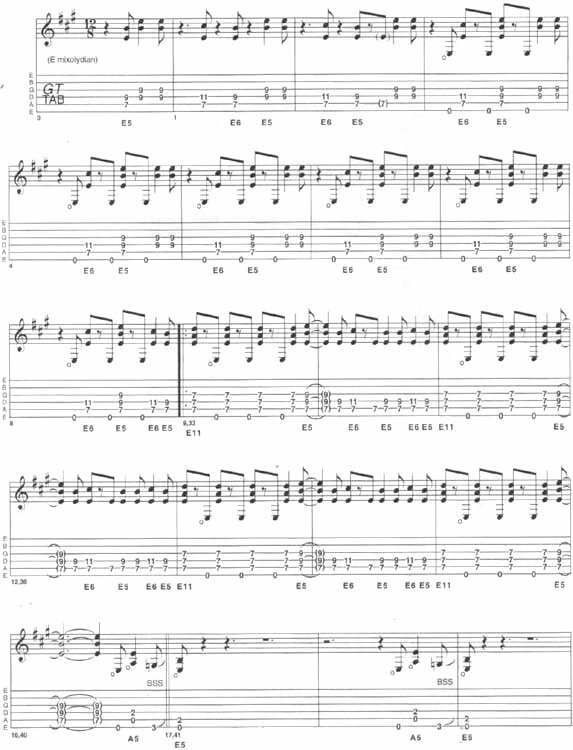 It’s just a part of Joe Walsh Rocky Mountain Way guitar tab and sheet. Looking for tabs or some riffs? We provide a huge collection of lessons, tutorials, guitar tabs and sheet music with backing tracks for FREE. © 2012 - 2019 TabsClub Powered by TabsClub 42 queries in 0.284 seconds. Materials may not be reproduced on another Web site, book, or publication without express written permission. For reprint permission contact us.